✓ Photo editing and Video editing not your thing? ✓ Seeking a way to scale your Matterport Service Provider business? ✓ Want your workday to end at 6 pm instead of ending well into the night? PhotoAndVideoEdits.com is a new service from a seasoned Matterport Service Provider (and long-time Member of the We Get Around Network, Colin Forte with @Hometakes in West Palm Beach, Florida). 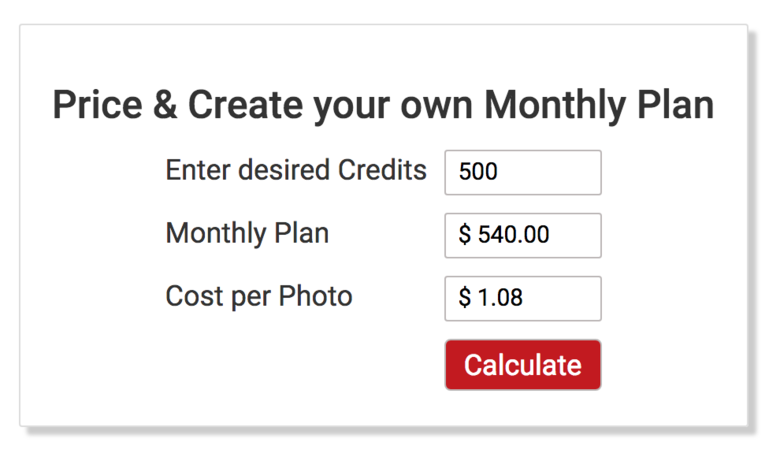 Colin developed workflows for photo and video editing for his own business and now offers his photo and editing service to you with his new platform, PhotoAndVideoEdits.com (years in the making). "Why does the founder of PhotoAndVideoEdits.com, Colin Forte, understand your clients as good as you? Because he was a client of a photographer and video tour operator. As a successful real estate agent selling $165 Million in a 3 year period, he understood that the single most important part in the home selling process is Great Photography and Videography," says the PhotoAndVideoEdits.com website. Now, you can finish your work-day at 6 pm and let PhotoAndVideoEdits.com do the ending overnight. How Much for Photo and Video Editing? This is something that you should test on your next shoot. Once you take PhotoAndVideoEdits.com for a spin, please share your thoughts here. "Thanks Dan, we do all our editing but it is something to keep in mind when we are overloaded. With video and photos we provide same day service. The most we have shot in a day was 16 and they were all delivered that day. I have always been hesitant on outsourcing video editing with the time it takes for large files to upload and send, I could probably edit them in the same amount of time. The pricing does seem reasonable though." You're a great candidate to scale your business via outsourcing video editing. You might do some test projects with PhotoAndVideoEdits.com so that you are familiar with the workflow, incase you are in a bind editing: especially since you get a free video editing for the first 12 months as a WGAN Standard Member. Hi, I have a question about the "credits". When I shoot DSLR pics, I shoot 5 shot brackets... so each picture is a combination of my 5 bracket shots. ONE credit for each pic, NOT 5? 1 credit for the final output photo: whether or not its a bracket of 3, 5 or 7 shots. Would you like me to Private Message you the We Get Around PhotoAndVideoEdits.com Promo Code Order Form for this new Membership Benefit? yes please... I'm paying a little MORE now, and i'm trying to save some bucks, while supporting our community! I (just) Private Messaged you the We Get Around PhotoAndVideoEdits.com Promo Code Order Form and password. Please feel free to share your experience with the WGAN Community too. @TheHomeBird - do you have samples of your work to show? So I just checked out what Colin Forte has been up to. It's been a year since I talked to him last about his desire to build his own Photo Editing Service. I actually did a bit of a trial run with him and was blown away by everything except, for some odd reason the method for straightening verticals was jamming me a bit. Still - I was blown away by how good his editors were getting my images... vibrant, crisp, perfect white balance, etc. Really phenominal. The one thing I did not like was having to order via e-mail and the fact that there was no infrastructure. Building a website is one thing. Building a system where you can submit your photos, view progress, add team members, manage billing, make special requests, have live chat, etc. -- that's a huge undertaking -- especially to get it RIGHT. I really think I under estimated Colin. Sorry. There are a lot of people who blow hot air. There are a lot of salespeople out there. Brilliant salespeople, mind you. We are brilliant salespeople, but we often sell other people's work. With Matterport Tours, sure we capture - but we didn't do the processing and we didn't make our own cameras. We sell it. Some of us capture better than others, but many clients don't know that. With photo editing, I imagine that Colin is not editing these photos. He's selling a service that he has built based on his understanding of what he wants and the processes he follows. He's also selling a service that he took from imagination to implementation -- each feature, the words on the pages, the way that everything works. I've gotta say, I'm pretty stoked at what he has built. I use another service that I like - but that is inconsistent at times. 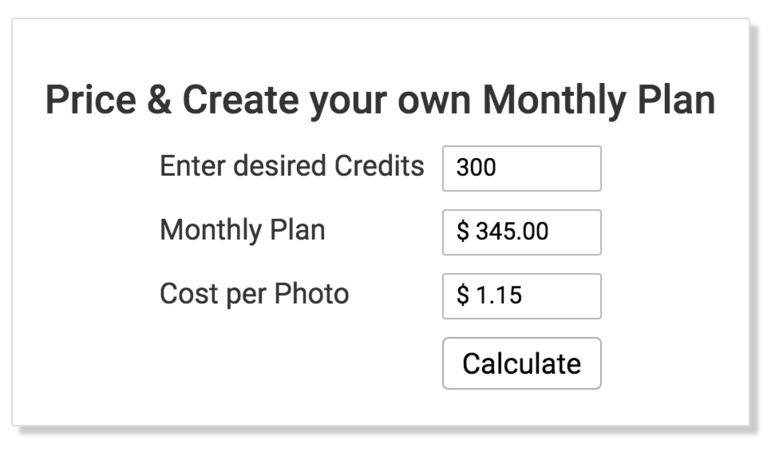 Amazing customer support and good pricing, but I often end out running through the photos one last time and making edits to where it looks like my work. I have a workflow down, but that's $. My time is $. I'll zoom back in a week or so and let you guys know how it goes. I'll just say this much -- I expected to be underwhelmed. I'm blown away. @TheHomeBird. The horizon on our sample video is a gimble issue and the both videos where shot on auto exposure, hence some darkness in the exposure. We may add some optional extras to our video edits such as horizon straightening and exposure adjustments but for now we wanted to start with the basic editing and see how many requests we would get for those types of issues. @Chris. Thank you for the compliments Chris. Yes, you are right, I definitely don't do the edits, LOL! Just the same way as I have never shot a Property yet I own a very successful tour company and have done so for 12 years. What I do know is business and how to give the client the best value for money and experience/ease of use. I was in no hurry to rush this platform out. You are dead right, this isn't just a website, its a platform of huge infrastructure. I spent 2 months in India with my developer in the beginning and another 2 months toward the end of building this system. Anyone that has been to India will know that 2 months at a time is long long time to spend there. There may be a few bugs to iron out, but I think I got it right when I say its a very easy and intuitive platform to use. This is set up for photographers around the world and I have had sign ups from Croatia to Australia already. We even have our own built in texting feature to anywhere in the world so that if we need to ask anyone a question quickly, that we can contact them so that they can text back and forth to their photo. I signed up and am very happy so far with everything! Another GREAT benefit to being a member of We Get Around!!!! 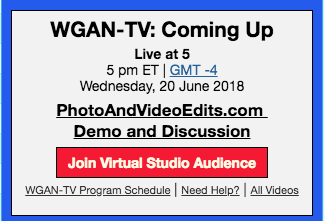 Great WGAN-TV Live at 5 show planned for you today (Wednesday, 18 July 2018). In addition to discussing Best Practices Shooting Real Estate Photos with @PhotoAndVideoEdits Founder Colin Forte, we'll also discuss the workflow of having PhotoAndVideoEdits.com edit your photos. 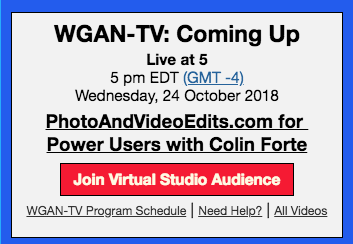 Plus, feel free to join the Virtual Studio Audience if you would like to ask Colin questions on the show. 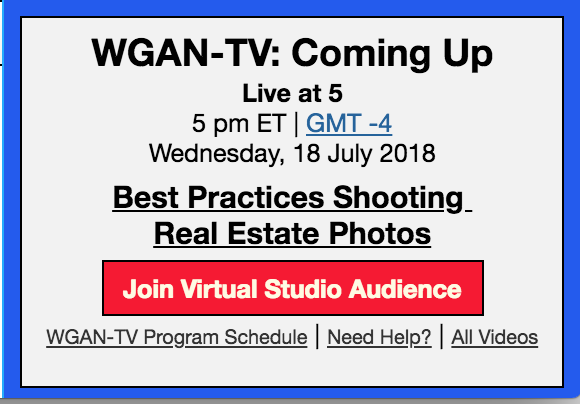 Above is today's WGAN-TV Live at 5. Even Pro still photographers will find Colin's take on photo shooting workflow transformational to saving time to make more money. Great viewing during Labor Day Weekend.